Looks like bounty hunting isn’t the only thing Boba’s doing to finance his ‘Vett. The Fett’s gone into producing epic rock albums. Which makes sense, ya know. He is kind of a badass. I wouldn’t be surprised if he goes home and wails on his guitar every night. Practicing with all the other bounty hunters. Bossk on the drums, IG-88 on the bass, Cad Bane on the keys. 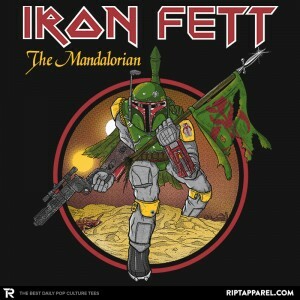 Yeah, Iron Maiden’s got nothin’ on the Bounty Hunters. Or Iron Fett. Or whatever. Just wrap this piece of cloth around your torso to show support for the rock that could have been!